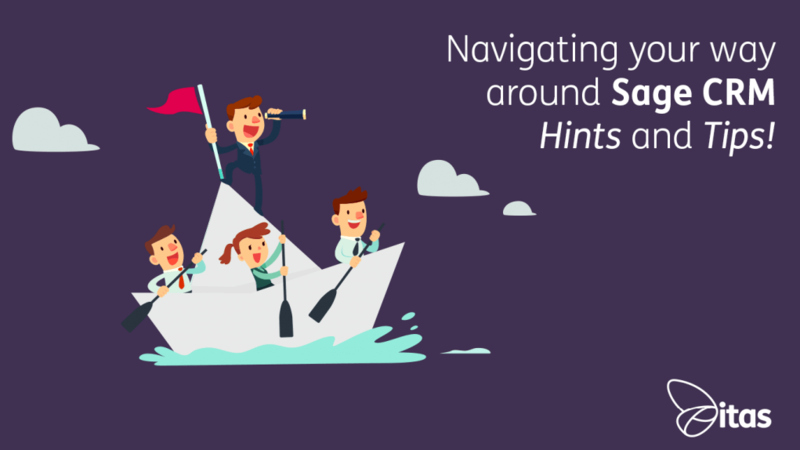 Navigating your way around Sage CRM - Hints and Tips! Our friends at Sage offer a powerful CRM tool for managing your businesses needs. Sage CRM provides solutions for automating processes using powerful workflow rules, capturing and maintaining information accurately and generating, creating and executing marketing campaigns among a few uses! It can create and provide you with super efficient customer service processes. Having a powerful CRM system at your fingertips can also add value in creating records and knowledge banks for your business preventing against risks such as changes in personnel. The analysis functions and reports within Sage CRM can help identify opportunities or process improvements. You can choose from a number of deployment options – Cloud or Server Based depending on your business infrastructure. Whatever you choose we can provide fully supported installations and configuration at itas plus ongoing support as required. Still unsure on the value a CRM solution may bring to your business? For more information on Sage CRM solutions we offer a free consultation to talk about CRM and what you are looking for. Get in touch today for a free demo. Already a user? Then lets jump right ahead to some of our favourite tips for navigating your way around Sage CRM. In your top right hand corner you’ll find the top bar navigation icons. In the Sage 2017 release additional new features were added to the top bar to help you fly around CRM at speed. Notifications – The notifications list is displayed under the Notifications Icon rather than at the top of the screen. Favourites – Any items added to your favourites can be found here. You can add items to your favourites by selecting the star when you are in the relevant record. Recent – This will provide you with quick links to any items you have recently visited. You can expand or collapse the categories using the arrows to navigate around the drop down and jump to the category of your choice. You can also clear your list to refresh it and allow it to rebuild. Profile Menu – Within your profile menu you have further choices to amend your personal settings through Preferences and dependent on role you may have access to Administration for your global CRM settings. 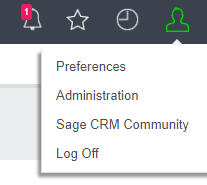 You will also have a link to the Sage CRM Community where you can find a host of information such as documents, videos and even more tips! One of our favourites at itas is the Quick Find functionality. 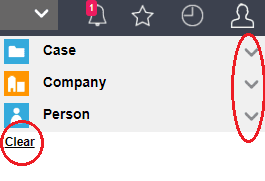 This feature allows you to enter key terms and search all company, people, case, opportunity, lead, solution, communication, order, quote, and custom entity records at once. In any screen in CRM you can Press Ctrl + S on your keyboard to jump to Search. 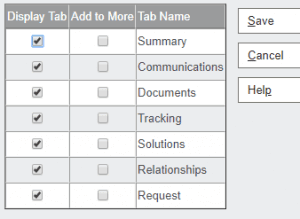 Dependent on how you are using CRM you may want to modify the tabs shown in your menu bar. Its simple to select what is shown. Select the ellipsis icon (…) at the end of your menu or choose Configure from your main menu. This will bring up your customise tab menu. By selecting or deselecting ‘Display Tab’ it will hide the tab from the menu bar. If you choose to ‘Add to More’ a new menu option More will appear displayed at the end of your menu and will give you a drop down list for tabs that you use infrequently but don’t want removed. More will only appear when at least one tab is added. Any tabs you add to more will not display in your Main Menu drop downs. Do you use the same search criteria often? Create a saved search to use the next time! Enter your desired criteria into the search menu. Once CRM has pulled all your information together look at the top right cornber whee you will see a drop down menu and disk icon. Select the disk icon to create a new search. Give it a name and save and hey presto it will be there for you next time in the drop down! We use Sage CRM for our case management system here at itas so we are dab hands at navigating and configuring options. If you need any support using CRM or have any training needs please contact us. We’re always happy to help! Home » Sage Blog » All Sage Blog Posts » Navigating your way around Sage CRM – Hints and Tips!